If you follow the rumour mill as closely as i do the you would have heard of Codex Craftworld. When it first surfaced this rumour was confusing as it appeared to be the new Eldar Codex, which was confusing because Eldar already have a 7rh Ed Codex and its still pretty good. However recent fresh rumours seem to indicate that its a sort of supplement codex that will allow Eldar players to play a army from one of the main Eldar Craftwolrds. This had already been tried once before in 3rd Edition 40k with the "Mini Codex" Craftwolrd Eldar. At this stage nothing is confirmed, and it wont be until the week before release, but it looks like this is not a new Eldar codex but instead a revival of the old 3rd ed supplement codex. Now i see this as a sign of progress and a step in the right direction. All the recent 40k codex have lacked character, aside from the Space Marine Codex. They feel sort of bland and really the only real difference between 2 Tau armies would be the colour scheme. 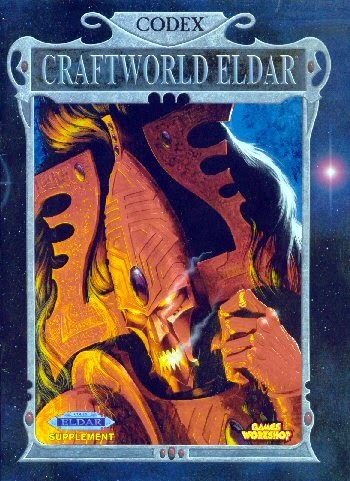 If Codex Craftwolrd does allow Eldar players to play Eldar armies from the main Craftworlds then this will generate diversity in the army, it will inspire players to make heavily themed armies, it will encourage players to make different lists and use different play styles and overall improve the game. My personal hope is that all the armies get one of these books and that one day we will see rules for Blood Axe Orks, Behemoth Tyranids or even the Tanith 1st. Ultimately we wont know until the book is actually released but what with 7th coming out so soon after 6th and all 40k armies having a 6/7th book GW cant really either release 8th or new books so it could be that this is their new release plan for 40k for the next year and a half. Who knows, but we can still hope. Until next time. Who knows, maybe an Evil Sunz book would give us Orks the sorely needed new Warbuggy. Hopefully, and maybe even the AOBR Deffkopters. With all the Codexs now up to date the time between now and 8th is when that sort of thing is most likely to get done.